Keep pushing...keep pushing until something breaks. 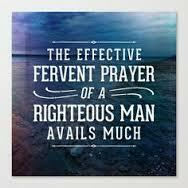 The bible says, the fervent prayers of a righteous man availeth much; making tremendous power available , dynamic in its working. ( James 5:16) Fervent means to be intensely devoted or intensely committed. This means we should not let the small things throw us out of the race. We should be head strong in our faith in God. We should be confident that He hears us, and that He will answer.There is no accomplishment without work. Let's not get weary on well doing. Knowing that we will reap if we faint not. ...I admonish you to keep going in God today. Don't stop. So let's stay in the battle and push forward to our destiny.